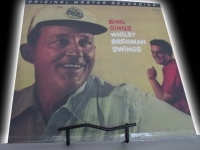 "Bing Crosby, Bing Sings Whilst Bregman Swings "
MFSL Anadisq 200 Gram 1/2 Speed LP "Out of Print, Last Copies". Tracks Include: "Mountain Greenery" "'Deed I Do" "The Song Is You" "Heat Wave" "Check To Check" "Have You Met Miss Jones?" "The Blue Room" "They All Laughed" "I've Got Five Dollars" "September In The Rain" "Nice Work If You Can Get It" "Jeepers Creepers"